I shot this photo at an old sawmill where I was shooting some of the old machinery, a subject that I enjoy shooting and converting to black and white images. What caught my eye with this scene though was the juxtaposition of the old rusting wheel of the lumber cart, the steel track, and the new, young weeds of spring! No black and white for this shot! 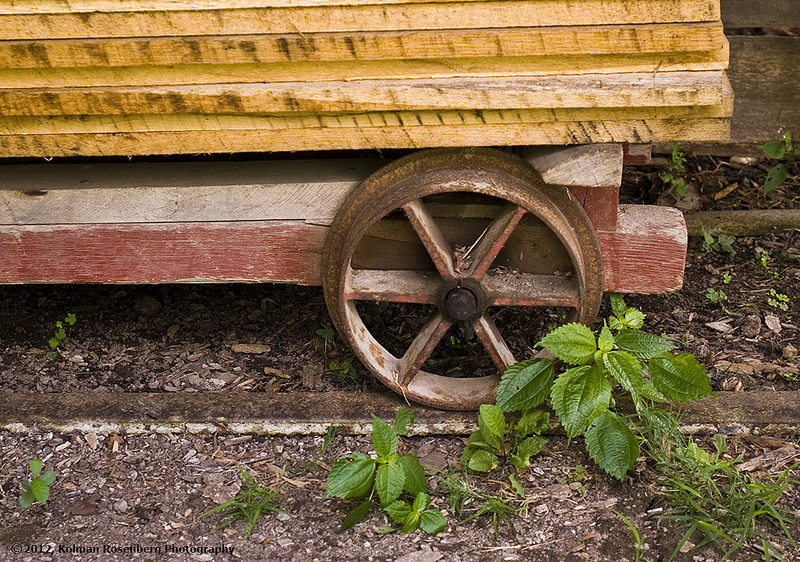 The bright green weeds screamed to be shown in color, in contrast to the fading red and orange colors of the cart and wheel. A simple shot and another example of seeing commonplace items and scenes that are easily overlooked. This entry was posted in Uncategorized and tagged antique, cart, color, iron, lumber, old, sawmill, steel, track, weeds. Bookmark the permalink.